With an international group of researchers (The Netherlands, Turkey and Germany), I have explored some of the advantages that shrinking cities may actually have over other urban areas, especially concerning green areas and living costs. Our article was recently published in Environment and Planning A (2013, volume 45). In June this year, the work was presented in La Coruña (IAPS 2013), and earlier in Eindhoven (Environment 2.0). Dense country or suburban region? The Netherlands are internationally renowned for strong top-down spatial planning and compact city policy. However, when we see the results of 40 years of planning attempts in the Dutch metropolitan area, known as Randstad, one wonders what the hell happened in practice. The PBL institute recently launched a publication on New Towns and Suburban Development in The Netherlands, with a set of incredible urban growth maps. At the end of the 1950’s, national politicians came to the conclusion that the cities Amsterdam, Rotterdam, The Hague and Utrecht were about to form a ring shaped metropolis, hence the name Randstad. Afraid of becoming a metropolis, like Paris (at the time apparently this was something awful), it was decided that the so-called ‘green heart’ would remain rural. To accomodate the demand for new housing in the 1970’s, a series of new towns were built along train connections near the major cities. Policies to use large locations near urban ring roads and highways for urbanization (Vinex, late 1980’s to early 2000’s) and the following ‘concentrated deconcentration’ – something almost inexplicable meaning as much as medium-density sprawl, did the rest. The result in the Randstad area over 40 years time, is an inversion of land use patterns. From a series of seperate cities in an agricultural setting, it became a suburban landscape, with islands of agriculture and recreational spaces. Does this mean The Netherlands as a whole are turning into a giant suburb? No, two thirds of the country still have agricultural use and especially the periphery of the country is not likely to experience strong urban growth. 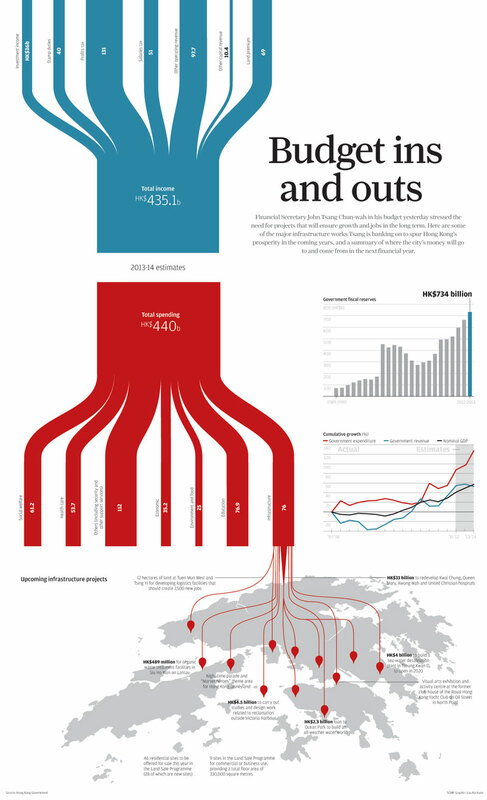 The South China Morning Post is featuring a series of well designed infographics on the territory of Hong Kong. 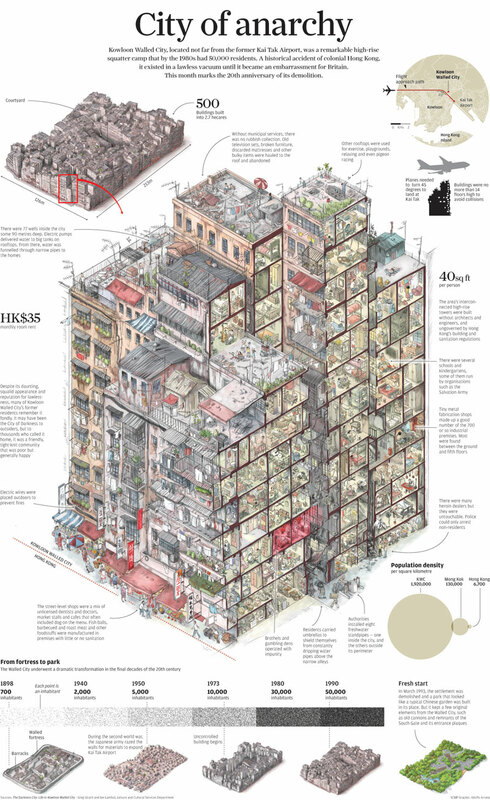 They discuss, for example, the demolished Walled City in Kowloon, light pollution, public investment budgets, and political power structures (who rules China?). 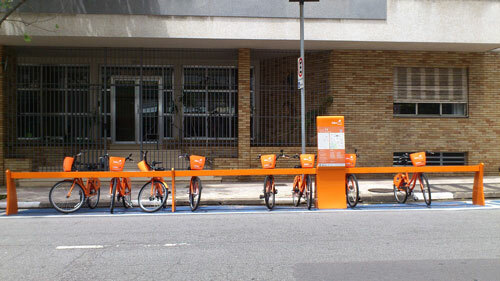 São Paulo is becoming more bike-minded. This does not seem surprising, regarding the global trend of urban bike culture as an alternative to car use and public transport, or as a hip subculture. 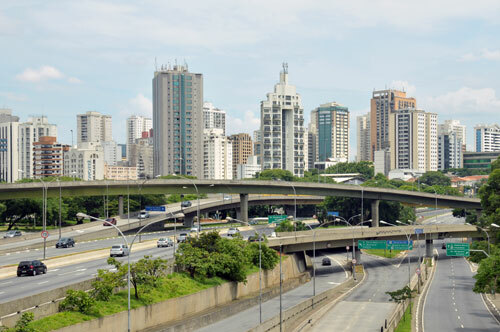 But those who know the city of São Paulo and its inhabitants, will affirm that a revolution is taking place. This city of car lovers and manufacturers, hills and valleys, broad avenues and potholes, is probably one of the most bike-unfriendly environments on the planet. The average driver here has been tormented for years by traffic jams and strings of ´motoboys´ that zigzag their way through traffic as mavericks. For him, two-wheelers are the enemy. Biking may have a promising future in the city, in the light of increasing congestion and air pollution, if only it were a bit safer. 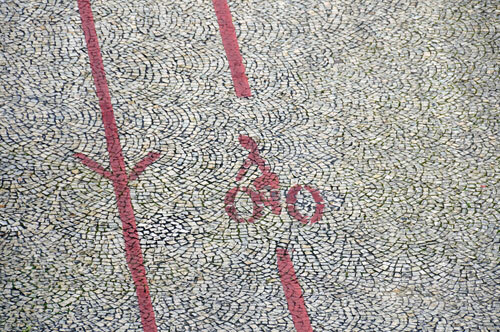 I tried to bike to work for a couple of weeks in central São Paulo, but downhill I almost got killed several times, and biking uphill behind a fuming bus or truck equals smoking a pack of cigarettes. Over the last decade, a small number of bike lanes was implemented, mainly in parks and in the center of arterial roads. The Minhocão viaduct is a well-known meeting place for bikers. More and more bike events and trips have been organized, especially at night and in the weekends. 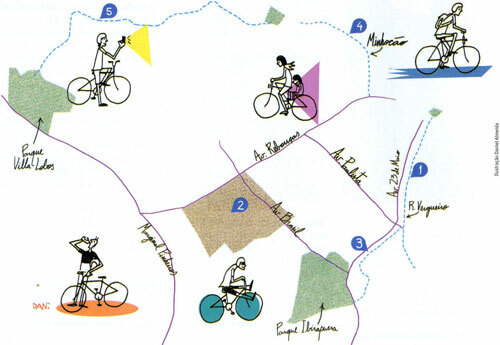 Recently, the municipality organizes temporary bike routes – called Ciclofaixa, that are slowly becoming a network for recreational biking. Hip bike stores are popping up throughout the central area, as well as bike rental points comparable to those in London or Paris. 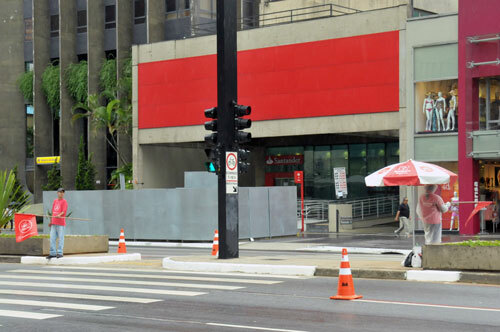 Dozens of municipal employees with red flags, guarding each crossing of the temporary bike lane, remind us that biking is still not completely safe in the city, but at least it´s possible. Big trucks are increasingly banned to the ring roads, and cars are becoming cleaner. 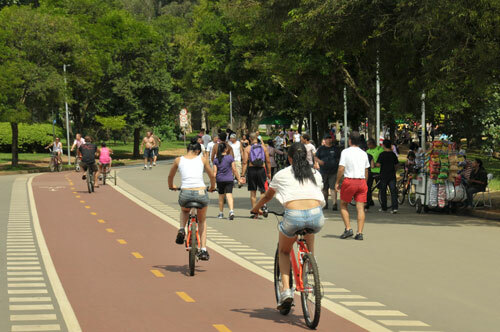 As soon as the smaller, greener roads are incorporated into a permanent bike network, São Paulo could be a great place to ride a bicycle. The hill tops of the slums in Rio de Janeiro used to be the least accessible areas in the city, plagued by violent drug traffic and lack of infrastructure. 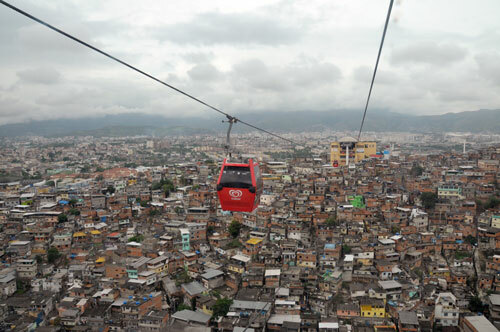 A recent project of cable cars, linking 5 hill tops around the favela Complexo do Alemão to a suburban railway station, is turning this reality upside down. As ground access in the hilly area continues to be difficult, the hill tops are becoming hot spots for new economic activity and gathering. At several stations, small shops appear and restaurants are being set up for the small but steady number of tourists riding on the cable car. Close to each station, a so-called ´pacification police unit´ is installed. The cable car system is run by local workers of the neighborhood itself. 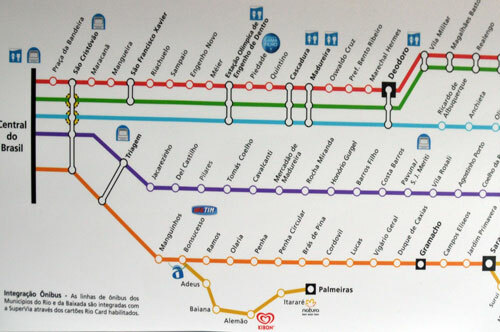 The line (see bottom of transit map) was built in 2011 and is to transport 30 thousand people per day, increasing the proximity of jobs and services. 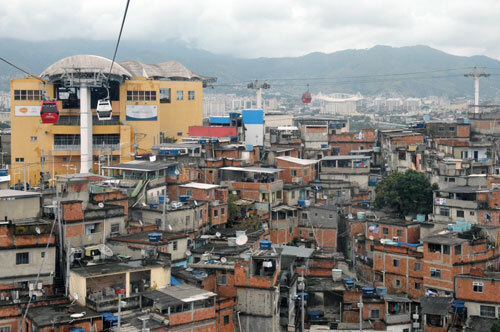 This effectively turns the former favela from a no-go area into a part of the ´formal´ city. 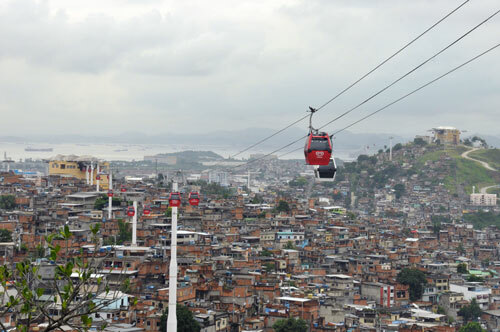 The reduction of poverty and increase of government control of these areas are key elements of Rio´s strategy to make the city a safe place to organize the World Cup in 2014 and the Olympics in 2016. And without accessibility, non of this will be possible. To reduce costs, cable car stations are being sponsored by Kibon and other private companies.